William Averell Harriman (November 15, 1891 – July 26, 1986), better known as Averell Harriman, was an American Democratic politician, businessman, and diplomat. The son of railroad baron E. H. Harriman, he served as Secretary of Commerce under President Harry S. Truman and later as the 48th Governor of New York. He was a candidate for the Democratic presidential nomination in 1952 and 1956, as well as a core member of the group of foreign policy elders known as "The Wise Men". While attending Groton School and Yale University, he made contacts that led to creation of a banking firm that eventually merged into Brown Brothers Harriman & Co.. He owned parts of various other companies, including Union Pacific Railroad, Merchant Shipping Corporation, and Polaroid Corporation. 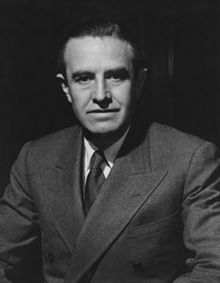 During the presidency of Franklin D. Roosevelt, Harriman served in the National Recovery Administration and on the Business Advisory Council before moving into foreign policy roles. After helping to coordinate the Lend-Lease program, Harriman served as the ambassador to the Soviet Union and attended the major World War II conferences. After the war, he became a prominent advocate of George F. Kennan's policy of containment. He also served as Secretary of Commerce, and coordinated the implementation of the Marshall Plan. In 1954, Harriman defeated Republican Senator Irving Ives to become the Governor of New York. He served a single term before his defeat by Nelson Rockefeller in the 1958 election. Harriman unsuccessfully sought the presidential nomination at the 1952 Democratic National Convention and the 1956 Democratic National Convention. Though Harriman had Truman's backing at the 1956 convention, the Democrats nominated Adlai Stevenson II in both elections. After his gubernatorial defeat, Harriman became a widely respected foreign policy elder within the Democratic Party. He helped negotiate the Partial Nuclear Test Ban Treaty during President John F. Kennedy's administration and was deeply involved in the Vietnam War during the Kennedy and Lyndon B. Johnson administrations. After Johnson left office in 1969, Harriman affiliated with various organizations, including the Club of Rome and the Council on Foreign Relations. Better known as Averell Harriman, he was born in New York City, the son of railroad baron Edward Henry Harriman and Mary Williamson Averell. He was the brother of E. Roland Harriman and Mary Harriman Rumsey. Harriman was a close friend of Hall Roosevelt, the brother of Eleanor Roosevelt. During the summer of 1899, Harriman's father organized the Harriman Alaska Expedition, a philanthropic-scientific survey of coastal Alaska and Russia that attracted 25 of the leading scientific, naturalist, and artist luminaries of the day, including John Muir, John Burroughs, George Bird Grinnell, C. Hart Merriam, Grove Karl Gilbert, and Edward Curtis, along with 100 family members and staff, aboard the steamship George Elder. Young Harriman would have his first introduction to Russia, a nation on which he would spend a significant amount of attention in his later life in public service. Using money from his father he established W.A. Harriman & Co banking business in 1922. In 1927 his brother Roland joined the business and the name was changed to Harriman Brothers & Company. In 1931, it merged with Brown Bros. & Co. to create the highly successful Wall Street firm Brown Brothers Harriman & Co. Notable employees included George Herbert Walker and his son-in-law Prescott Bush. Harriman's main properties included Brown Brothers & Harriman & Co, Union Pacific Railroad, Merchant Shipbuilding Corporation, and venture capital investments that included the Polaroid Corporation. Harriman's associated properties included the Southern Pacific Railroad (including the Central Pacific Railroad), Illinois Central Railroad, Wells Fargo & Co., the Pacific Mail Steamship Co., American Ship & Commerce, Hamburg-Amerikanische Packetfahrt-Aktiengesellschaft (HAPAG), the American Hawaiian Steamship Co., United American Lines, the Guaranty Trust Company, and the Union Banking Corporation. He served as Chairman of The Business Council, then known as the Business Advisory Council for the United States Department of Commerce in 1937 and 1939. Harriman's older sister, Mary Rumsey, encouraged Averell to leave his finance job and work with her and their friends, the Roosevelts, to advance the goals of the New Deal. Averell joined the NRA National Recovery Administration, the first government consumer rights group, marking the beginning of his political career. Following the death of August Belmont Jr., in 1924, Harriman, George Walker, and Joseph E. Widener purchased much of Belmont's thoroughbred breeding stock. Harriman raced under the nom de course of Arden Farm. Among his horses, Chance Play won the 1927 Jockey Club Gold Cup. He also raced in partnership with Walker under the name Log Cabin Stable before buying him out. U.S. Racing Hall of Fame inductee Louis Feustel, trainer of Man o' War, trained the Log Cabin horses until 1926. Of the partnership's successful runners purchased from the August Belmont estate, Ladkin is best remembered for defeating the European star Epinard in the International Special. Harriman's banking business was the main Wall Street connection for German companies and the varied U.S. financial interests of Fritz Thyssen; who was a financial backer of the Nazi party until 1938. The Trading With the Enemy Act (enacted on October 6, 1917) classified any business transactions for profit with enemy nations as illegal, and any funds or assets involved were subject to seizure by the U.S. government. The declaration of war on the U.S. by Hitler led to the U.S. government order on October 20, 1942 to seize German interests in the U.S. which included Harriman's operations in New York City. The assets were held by the government for the duration of the war, then returned afterward; UBC was dissolved in 1951. Compensation for wartime losses in Poland were based on prewar assets. Harriman, who owned vast coal reserves in Poland, was handsomely compensated for them through an agreement between the American and Polish governments. Poles who had owned little but their homes received negligible sums. Beginning in the spring of 1941, Harriman served President Franklin D. Roosevelt as a special envoy to Europe and helped coordinate the Lend-Lease program. He was present at the meeting between FDR and Winston Churchill at Placentia Bay, in August 1941, which yielded the Atlantic Charter. It was a common declaration of principles of the United States and the UK; It was eventually endorsed by all of the Allies. Harriman was subsequently dispatched to Moscow to negotiate the terms of the Lend-Lease agreement with the Soviet Union. His promise of $1 billion in aid technically exceeded his brief. Determined to win over the doubtful American public, he used his own funds to purchase time on CBS radio to explain the program in terms of enlightened self-interest. This skepticism lifted with the Japanese attack on Pearl Harbor. On November 25, 1941 (twelve days before the Japanese attack on Pearl Harbor), he noted that "The United States Navy is shooting the Germans—German submarines and aircraft at sea". In the summer of 1942, Harriman accompanied Churchill to the Moscow Conference to explain to Stalin why the western allies were carrying out operations in North Africa instead of opening the promised second front in France. Harriman was appointed as United States Ambassador to the Soviet Union in 1943. At the Tehran Conference in late 1943 Harriman was tasked with placating a suspicious Churchill while Roosevelt attempted to gain the confidence of Stalin. The conference highlighted the divisions between the United States and Britain about the postwar world. Churchill was intent on maintaining Britain's empire and carving the postwar world into spheres of influence while the United States upheld the principles of self-determination as laid out in the Atlantic Charter. Harriman mistrusted the Soviet leader's motives and intentions and opposed the spheres approach as it would give Stalin a free hand in eastern Europe. Harriman also attended the Yalta Conference, where he encouraged taking a stronger line with the Soviet Union—especially on questions of Poland. After Roosevelt's death, he attended the final "Big Three" conference at Potsdam. Although the new president, Harry Truman, was receptive to Harriman's anti-Soviet hard line advice, the new secretary of state, James Byrnes, managed to sideline him. While in Berlin, he noted the tight security imposed by Soviet military authorities and the beginnings of a program of reparations by which the Soviets were stripping out German industry. In 1945, while Ambassador to the Soviet Union, Harriman was presented with a Trojan Horse gift. In 1952, the gift, a carved wood Great Seal of the United States, which had adorned "the ambassador's Moscow residential office" in Spaso House, was found to be bugged. Harriman served as ambassador to the Soviet Union until January 1946. When he returned to the United States, he worked hard to get George Kennan's Long Telegram into wide distribution. Kennan's analysis, which generally lined up with Harriman's, became the cornerstone of Truman's Cold War strategy of containment. From April to October 1946, he was ambassador to Britain, but he was soon appointed to become United States Secretary of Commerce under President Harry S. Truman to replace Henry A. Wallace, a critic of Truman's foreign policies. In 1948, he was put in charge of the Marshall Plan. In Paris, he became friendly with the CIA agent Irving Brown, who organised anti-communist unions and organisations. Harriman was then sent to Tehran in July 1951 to mediate between Iran and Britain in the wake of the Iranian nationalization of the Anglo-Iranian Oil Company. In the 1954 race to succeed Republican Thomas E. Dewey as Governor of New York, Harriman defeated Dewey's protege, U.S. Senator Irving M. Ives, by a tiny margin. He served as governor for one term until Republican Nelson Rockefeller unseated him in 1958. As governor, he increased personal taxes by 11% but his tenure was dominated by his presidential ambitions. Harriman was a candidate for the Democratic Presidential Nomination in 1952, and again in 1956 when he was endorsed by Truman but lost (both times) to Illinois governor Adlai Stevenson. Despite the failure of his presidential ambitions, Harriman became a widely respected elder statesman of the party. In January 1961, he was appointed Ambassador at Large in the Kennedy administration, a position he held until November, when he became Assistant Secretary of State for Far Eastern Affairs. In 1961, at the suggestion of Ambassador Charles W. Yost Harriman represented President Kennedy at the funeral of King Mohammed V of Morocco. During this period he advocated U.S. support of a neutral government in Laos and helped to negotiate the Partial Nuclear Test Ban Treaty in 1963. In December 1961, Anatoliy Golitsyn defected from the Soviet Union and accused Harriman of being a Soviet spy, but his claims were dismissed by the CIA and Harriman remained in his position until April 1963, when he became Under Secretary of State for Political Affairs. He retained that position during the transition to the Johnson administration until March 1965 when he again became Ambassador at Large. He held that position for the remainder of Johnson's presidency. Harriman headed the U.S. delegation to the preliminary peace talks in Paris between the United States and North Vietnam (1968–69). President-elect Kennedy appointed Harriman as ambassador-at-large, to operate "with the full confidence of the president and an intimate knowledge of all aspects of United States policy." But by 1963, Kennedy had come to suspect the loyalty of certain members on his national security team. According to Colonel William Corson, USMC, by 1963 Harriman was running "Vietnam without consulting the president or the attorney general.". Corson said Kenny O'Donnell, JFK's appointments secretary, was convinced that the National Security Advisor, McGeorge Bundy, followed the orders of Harriman rather than the president. Corson also claimed that O'Donnell was particularly concerned about Michael Forrestal, a young White House staffer who handled liaison on Vietnam with Harriman. Harriman certainly supported the coup against the South Vietnam president Ngo Dinh Diem in 1963. However, it is alleged that the orders that ended in the deaths of Diem and his brother actually originated with Harriman and were carried out by Henry Cabot Lodge Jr.'s military assistant. The fundamental question about the murders was the sudden and unusual recall of Saigon Station Chief John "Jocko" Richardson by an unknown authority. Special Operations Army officer, John Michael Dunn, was sent to Vietnam in his stead. He followed the orders of Harriman and Forrestal rather than the CIA. According to Corson, Dunn's role in the incident has never been made public but he was assigned to Ambassador Lodge for "special operations" with the authority to act without hindrance; and he was known to have access to the coup plotters. Corson speculated that with Richardson recalled the way was clear for Dunn to freely act. Harriman received the Presidential Medal of Freedom, with Distinction, in 1969 and West Point's Sylvanus Thayer Award in 1975. Furthermore, in 1983 he received the Freedom Medal. In 1973 he was interviewed in the now famous TV documentary series, The World at War, where he gives a recollection of his experiences as Roosevelt's personal representative in Britain along with his views on Cold War politics; in particular Poland and the Warsaw Pact; along with the exchanges he witnessed between Winston Churchill, Franklin Roosevelt, and Joseph Stalin. In one such recollection he describes Stalin as utterly cruel. About a year after his divorce from Lawrence, he married Marie Norton Whitney (1903–1970), who had left her husband, Cornelius Vanderbilt Whitney, to marry him. On their honeymoon in Europe, they purchased oil paintings by Van Gogh, Degas, Cézanne, Picasso, and Renoir. She and her husband later donated many of the works she bought and collected, including those of the artist Walt Kuhn, to the National Gallery of Art in Washington, D.C. They remained married until her death on September 26, 1970, at George Washington University Hospital in Washington, D.C. In 1971, he married for the third and final time to Pamela Beryl Digby Churchill Hayward (1920–1997), the former wife of Winston Churchill's son Randolph, and widow of Broadway producer Leland Hayward. Harriman and Pamela Churchill had had an affair during the War in 1941 which led to the breakdown of her marriage to Randolph Churchill. In 1993, she became the 58th United States Ambassador to France. Harriman died on July 26, 1986 in Yorktown Heights, New York, at the age of 94. Averell and Pamela Harriman are buried at the Arden Farm Graveyard in Arden, New York. Forum on the 100th anniversary of the birth of Harriman, hosted by the Library of Congress, November 14, 1991. Participants include James H. Billington, McGeorge Bundy, Richard C. Holbrooke, Marshall Shulman, and Cyrus Vance. The Harriman Hall at Stony Brook University was named in his honor. The W. Averell Harriman State Office Building Campus in Albany, NY also carries his name. For the state park in New York named after his parents, see Harriman State Park (New York). Harriman State Park is a state park in eastern Idaho, United States. It is located on an 11,000-acre (45 km2) wildlife refuge in the Greater Yellowstone Ecosystem and is home to an abundance of elk, moose, sandhill cranes, trumpeter swans, and the occasional black or grizzly bear. Two-thirds of the trumpeter swans that winter in the contiguous United States spend the season in Harriman State Park. The land was deeded to Idaho for free in 1977 by Roland and W. Averell Harriman, whose insistence that the state have a professional park managing service helped prompt the creation of the Idaho Department of Parks and Recreation in 1965. The park opened to the public in 1982. It is located in Fremont County, 3 miles (4.8 km) south of Island Park, Idaho. Henry's Fork, a fly-fishing stream, winds through the meadows of Harriman State Park. In winter, many of its roads and trails are groomed for cross country skiing. ^ Theodore A. Wilson, The First Summit: Roosevelt and Churchill at Placentia Bay, 1941 (1991). ^ a b c d e Cathal J. Nolan, Notable U.S. ambassadors since 1775: a biographical dictionary, 137-143. ^ "National Cryptologic Museum - NSA/CSS". nsa.gov. ^ Frédéric Charpier, La CIA en France. 60 ans d'ingérence dans les affaires françaises, Seuil, 2008, p. 40–43. See also Les belles aventures de la CIA en France Archived 2007-04-20 at Archive.today, 8 January 2008, Bakchich. ^ a b c d "The Secret History of the CIA." Joseph Trento. 2001, Prima Publishing. pp. 334–335. ^ "Presidential Recordings Program". whitehousetapes.org. ^ Staff (July 3, 1915). "MISS LAWRANCE TO WED W. A. HARRIMAN Romance in Match of Late Railroad Magnate's Son and C. Lanier's Granddaughter. FIANCEE A SPORTS DEVOTEE Just Recovered from Injury Received While Horseback Riding with the Young Financier". The New York Times. Retrieved 7 April 2016. ^ "W.A. Harriman Wed to Mrs. C.V. Whitney" (PDF). New York Times. February 22, 1930. Retrieved February 17, 2015. ^ Saxon, Wolfgang (January 10, 1996). "Mary A. Fisk, 78, an Advocate Of Tutoring in Primary Grades". The New York Times. Retrieved 26 March 2016. ^ Fox, Margalit (February 19, 2011). "Kathleen Mortimer, Rich and Adventurous, Dies at 93". The New York Times. Retrieved 15 March 2016. ^ Nemy, Enid (July 7, 1978). "Barbara Cushing Paley Dies at 63; Style Pace-Setter in Three Decades; Symbol of Taste". New York Times. Retrieved 2010-03-21. Barbara Cushing Paley, the wife of William S. Paley, the chairman of the board of the Columbia Broadcasting System, died of cancer at their apartment in New York City yesterday after a long illness. She was 63 years old. ^ Isaacson, Walter; Thomas, Evan (1986). The Wise Men: Six Friends and the World They Made. Simon & Schuster. p. 106. ^ "The Marie and Averell Harriman Collection". National Gallery of Art. Retrieved February 17, 2015. ^ "Mrs. W. Averell Harriman Dies; Former Governor's Wife Was 67". New York Times. September 27, 1970. Retrieved February 17, 2015. ^ Berger, Marilyn (6 February 1997). "Pamela Harriman Is Dead at 76; An Ardent Political Personality". The New York Times. Retrieved 15 December 2016. Abramson, Rudy (1992). Spanning the Century: The Life of W. Averell Harriman, 1891-1986. William Morrow & Co. ISBN 978-0688043520. Chandler, Harriette L. "The Transition to Cold Warrior: the Evolution of W. Averell Harriman's Assessment of the U.S.S.R.'s Polish Policy, October 1943-Warsaw Uprising." East European Quarterly 1976 10(2): 229-245. ISSN 0012-8449. Clemens, Diane S. "Averell Harriman, John Deane, the Joint Chiefs of Staff, and the 'Reversal of Co-operation' with the Soviet Union in April 1945." International History Review 1992 14(2): 277-306. ISSN 0707-5332. Isaacson, Walter; Thomas, Evan (1986). The Wise Men: Six Friends and the World They Made: Acheson, Bohlen, Harriman, Kennan, Lovett, McCloy. Simon & Schuster. ISBN 978-0671504656. Larsh, William. "W. Averell Harriman and the Polish Question, December 1943-August 1944." East European Politics and Societies 1993 7(3): 513-554. ISSN 0888-3254. Olson, Lynne (2010). Citizens of London: The Americans Who Stood with Britain in Its Darkest, Finest Hour. Random House. ISBN 978-1400067589. Soares, John, "Averell Harriman Has Changed His Mind: The Seattle Speech and the Rhetoric of Cold War Confrontation," Cold War History 9 (May 2009), 267–86. Harriman, W. Averell and Abel, Elie. Special Envoy to Churchill and Stalin, 1941–1946. (1975). 595 pp. Wikimedia Commons has media related to W. Averell Harriman. W. Averell Harriman has been interviewed as part of Frontline Diplomacy: The Foreign Affairs Oral History Collection of the Association for Diplomatic Studies and Training, a site at the Library of Congress.